On a family vacation to the beach, you may come into contact with various members of the Echinodermata phylum, or echinoderms. You may even come home with a few as souvenirs. Starfish and sand dollars are echinoderms commonly found on the beach and in seaside gift shops. Another echinoderm is the prickly sea urchin. The uniform symmetry of echinoderms sets the creatures off from other marine life. All echinoderms are pentameral -- they have limbs in multiples of five. This trait is easily recognizable in starfish and brittle stars with only five limbs. 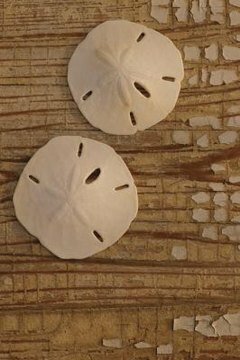 However, observing this trait in other echinoderms, like sea urchins and sand dollars, may be more difficult due to their round or disc shapes. Echinodermata means "spiny skinned." Surprisingly, the external spines are composed of the same material as the internal skeleton. Calcium carbonate and protein form the rigid inner skeleton, or ossicles, of echinoderms. The exoskeleton is composed of soft, spongelike micro-structures called stereom. The stereom fuse together on hard-shelled echinoderamata, like sea urchins and sand dollars, to form a test, or rigid outer shell. The Echinodermata phylum is the largest marine-only group, consisting of more than 6,000 species. Since echinoderms live only in water, their ambulacral systems -- internal tubes consisting of water-filled vesicles -- are extremely important. An ambulacral system stretches though all of the extensions of an echinoderm and operates the echinoderm’s feet. The system plays a role in oxygen exchange and assists with molecular nutrient intake. Members of the Echinodermata phylum are found in oceans all over the world. Echinoderms are either male or female. Fertilization generally occurs outside of echinoderms' bodies. Newly hatched echinoderm larvae are bilaterally symmetrical and planktotrophic: They feed off algae. Some species, like starfish, regenerate or regrow missing limbs and have the ability to reproduce asexually.